Surya Grahan 2018: Though what we will see is a partial solar eclipse only, but it is still an event to look out for, especially as it falls on Friday, 13th July which is today. Today, the world would be seeing the stunning visual of a partial solar eclipse or Surya Grahan. A solar eclipse or Surya Grahan is said to occur when the Moon passes between the Sun and Earth, as a result partially or fully blocking the Sun. While a total eclipse sees the entire Sun being obscured by the Moon for a brief period of time, a partial eclipse, and this is the type that happens more frequently, involves only partially blocking of the Sun. This is the second solar eclipse of the year, the last solar eclipse of 2018 is said to occur on 11th of August. Social media is abuzz with speculations about the eclipse, the interest mounts as the eclipse is occuring on Friday, the 13th. In popular culture, the date has been associated with many superstitions surrounding ill-luck. Experts says that the eclipse will be visible in parts of Southern Australia, such as Melbourne, Adelaide and Hobart, as well as in Stewart Island on the far south of New Zealand. The eclipse would not be visible to many; those inhabiting the Pacific and Indian Oceans would be able to see the eclipse better. A small part of northern Antarctica would be able to watch the eclipse too. 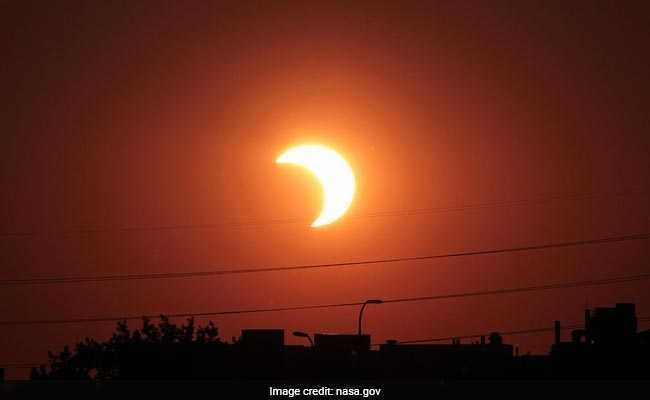 People who want to witness the solar eclipse or the Surya Grahan in India, may need special glasses, lenses and camera as the eclipse is not likely to be viewed with naked eyes. According to Indian local time, the partial solar eclipse or Surya Grahan would begin on 13th July 2018 at 07:18:23 a.m. and go on till 08:31:05 a.m. Though what we will see is a partial eclipse only, but it is still an event to look out for, especially as it falls on Friday the 13th. According to NASA, there has not been a solar eclipse on Friday the 13th since December 13, 1974. As such, there are many myths and beliefs associated with solar eclipses across the world. In many communities in India too it is believed that during the time of the eclipse people should refrain from eating food, drink water and preferably avoid all outdoor activities. Some believe this is also the time when people should sit at one place and meditate. In olden days, the period of eclipse was believed to be an inauspicious time as the main energy providing source - the Sun - was not clearly visible. It was believed that during the time of eclipse there is an increase in harmful agents, bacteria and germs due to the absence of the Sun's rays. This is the reason why some people would choose to consume their food after the eclipse only. In some households, they still toss away the food that has been there in the house during the eclipse, believing it may have deteriorated in terms of nutritive value. Many people do not believe or follow these practices anymore. The views of experts on the dietary do's and dont's during an eclipse differ too. While some sections of modern science dispel the idea of refraining from food or water during the period, practitioners of Ayurveda believe that staying away from food during the eclipse is advisable. Dr. Mitali Madhusmita , Senior Doctor, Sri Sri Tattva Panchkarna says, "It is advisable to have any food prior to eclipse or after. In the absence of sunlight, the bacteria tend to get active, which could prove detrimental for health. In fact, one should avoid cooking too for the same reason. This time around the eclipse is just for an hour, so it should not be so difficult to fast. People who are sick or tired, should not fast for the eclipse period. They can have light sattvik food that is easy to digest. To maintain their electrolyte balance they should load up on fluids like tender coconut water or just plain water. Nuts are very effective too, to induce strength and endurance. Long period of fasting may deteriorate their health further. Once the fast is over everybody can resume their usual diet. Adding turmeric to food is a good option, turmeric is a good immunomodulator and full of antioxidants which could help replenish the body from within after long fasting"
The eclipse would last for a duration of 1 hour 13 minutes. And the next solar eclipse of 2018 will occur on 11th August this year. That eclipse would also be partial and not total.